Tech N9ne is his name, and slayin' is his game. The master of rap horrorcore is out on a killing spree, moving from one city to the next. And yes, his fans are dying to catch him live as hits them hard with his “chopper” style of rhymes. Watch him take center stage at the Fillmore Auditorium on Saturday 18th May 2019. 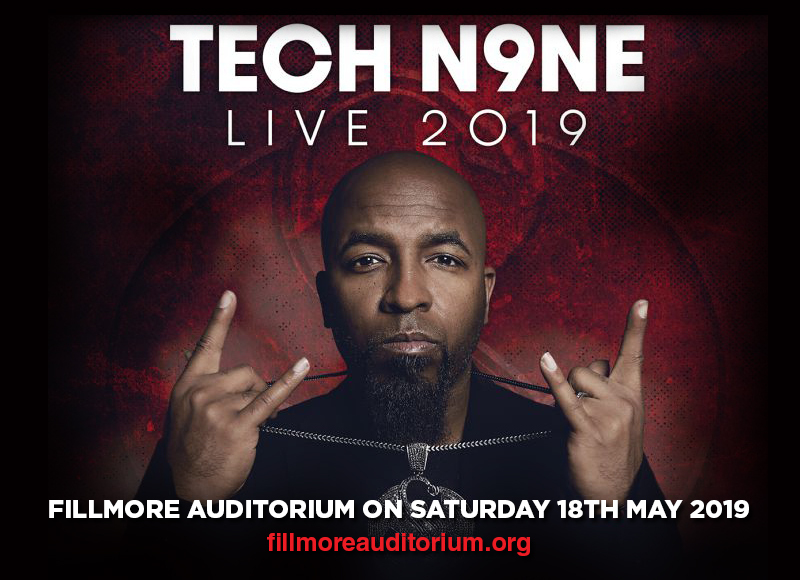 Tech N9ne has a track record of performing before jam-packed crowds, so it is imperative to save the date and lock-in your tickets to the show before it's too late. Book your tickets now! Aaron Dontez Yates a.k.a. Tech N9ne is one of the fastest rising rap artists to date. His origins may have come from the underground rap scene, but his songs managed to find the way up the mainstream audience and achieve chart action. His biggest mainstream hits include “Something Else,” “Special Effects,” “Strangulation” and “Welcome to Strangeland.” With his 11th album titled All 6’s and 7’s (2011), Tech N9ne hit No. 4 on the U.S. Billboard 200 and No. 1 on Billboard’s Top Rap Albums chart. His seventh album, Killer (2008), was a certified million-seller. Yet Tech N9ne is, in essence, a superstar, a master of rap horrorcore genre. He takes on the apocalyptic music style dealing with highly controversial and dark subjects matters. He is a bankable concert artist as well, a top-selling live act who consistently play before jam-packed concert venues. His rhythmic abilities that are driven by a compelling yet slick flow of beats and rhymes are always killing it, but audiences feel more alive than ever, pumped up by his raging energy and crazy party vibe. You and your homies better start loading up on tickets to the show. Don't miss this gig. It's now or never!